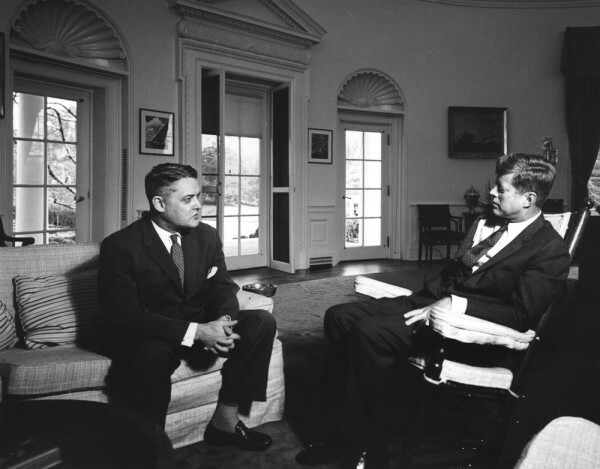 U.S. Foreign Service Officer E. Allan Lightner (left) with President John F. Kennedy. Lightner was the chief of the American mission in Berlin during the spy transfer on the so-called Bridge of Spies. 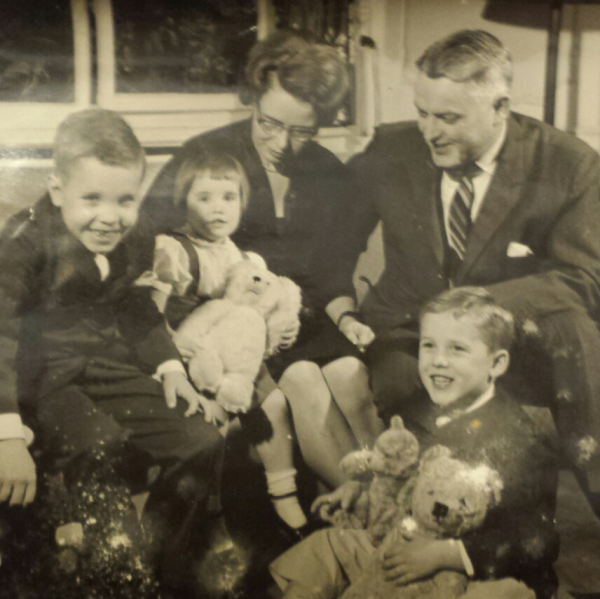 E. Allan Lightner and his wife, Dottie, with their children Ned, Babette and John during the years Lightner was chief of the American diplomatic mission in Berlin. He also was present for the spy swap on the so-called "Bridge of Spies" in Berlin, according to sons Ned and John, who live in Belfast. BELFAST, Maine — Belfast brothers Ned and John Lightner are looking forward to watching Cold War thriller “Bridge of Spies,” which opens this weekend at movie theaters. It’s not just because they are history aficionados. Nor is it because they are super fans of Tom Hanks, who portrays the Brooklyn lawyer who negotiates the release of Soviet spy Col. Rudolf Abel for Francis Gary Powers, the American whose U-2 spy plane was shot down over the Soviet Union. It’s because their father, career Foreign Service officer E. Allan Lightner, was on the so-called “Bridge of Spies” that morning in Berlin in 1962, when the spy exchange took place. The brothers were in Berlin, which they described as the flashpoint of the Cold War, during the events that led up to the exchange on the Glienicke Bridge. They were just kids then, too young to remember much about the delicate diplomacy that occupied their father, the chief of the United States mission in Berlin. They have good memories of Germany, where they were thrown into German schools, learned to speak the language and even wore lederhosen and jaunty German caps. But they also remember some of the darker aspects of that time in history, like the house across the street, which was still a bombed-out pile of rubble from World War II. And they remember the building of the Berlin Wall in August 1961. The day of the swap, their dad had to get up really early, and Lightner remembers getting up early, too, watching his parents getting ready in the predawn darkness. Later that morning, E. Allan Lightner joined James B. Donovan, the lawyer from Brooklyn, on the bridge with Abel, the spy who had been convicted of conspiracy in 1957 and sentenced to 45 years in federal prison. The exchange was successful: Abel crossed from West Berlin into communist-controlled Germany, and Powers, who had been imprisoned in the Soviet Union, came back. “I view Col. Abel as a soldier in battle — similar to Francis Gary Powers,” John Lightner said, looking back at the then-controversial spy swap. The brothers have even clearer memories of another incident involving their parents that sparked a frightening standoff between the two Cold War superpowers. In 1961, the American diplomatic corps was encouraged to move freely around Berlin despite the building of the wall. On the evening of Oct. 22, 1961, E. Allen and Dottie Lightner donned fancy clothes and got into their Volkswagen Beetle to go to the opera, which happened to be in the Communist-controlled sector of the city. They were stopped at Checkpoint Charlie, despite the diplomatic license plate on the car, and ordered to show credentials. When the foreign service officer refused, in accordance with American protocol at the time, the couple were ordered to turn around. “He said, ‘No, it’s my right to go through,’” Ned Lightner said. John Lightner said their dad put the VW in neutral and gunned it. The incident escalated, with neither the Americans nor the Soviets willing to back down. A platoon of armed American soldiers arrived to march the Lightners safely across the border, but over the next few days, heavy tanks rolled to both sides of Checkpoint Charlie, with artillery pointed at each other. The alert level was raised at NATO, then at the U.S. Strategic Air Command. After about a week of escalating tension, President John F. Kennedy and Soviet Premier Nikita Khrushchev agreed to withdraw the tanks and defuse the situation. The Berlin border crisis is often cited as one of the times the U.S. teetered closest to nuclear war, Ned Lightner said. “We proudly declaim it. Our parents brought us to the brink of World War III,” John Lightner said, jokingly. After four tumultuous years in Berlin, E. Allen Lightner was posted to Libya, where he was named the U.S. ambassador. After finishing out his career in the Foreign Service, he retired to the family home in Bayside. There, he watched with the rest of the world when the Berlin Wall came down in 1989. E. Allan Lightner died in Maine in 1990, an 82-year-old who had traveled to more countries and had more adventures than most. The brothers said they don’t expect a Hollywood actor will play the role of Lightner in “Bridge of Spies.” But that doesn’t matter, they said.